The AIRAID 201-142 fits some Chevrolet Colorado, GMC Canyon, Isuzu i-280, Isuzu i-290, Isuzu I350, and Isuzu i-370 models. See vehicle applications for details. The AIRAID Air Box System is engineered to give your engine larger amounts of cooler air to produce more horsepower and torque. The intake system retains the original location of the air filter but delivers a big boost with the addition of a huge open-element air inlet protected by Cold Air Dam panels that help to provide a steady, free-flowing supply of cooler outside air into your engine. The panels mount in the factory air box location and utilize any factory cold air inlet ducts that are present, while adding additional cold air passages to the filter. The panels also keep the filter isolated from the hot engine compartment air by sealing to the underside of the hood via blade-style weather stripping. This air box system connects to the factory air intake tube. The AIRAID premium air filter is washable and reusable, less restrictive than traditional paper, and assures superior filtration. 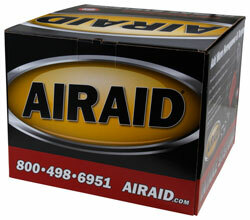 The AIRAID Air Box System is easy to install with common hand tools. Some AIRAID air box systems are not legal for sale or use in California and other states adopting California emission standards, while others are 50 state legal. View the product's vehicle applications to determine the legal status for each vehicle.